"You see, when a group of mankind is fortunate enough to come under the instruction and Radiation of a Great Master of Light, such as this Great Cosmic Being is, they are given an opportunity of seeing what the Plan of Life is for humanity, and the Perfection they are intended to bring forth and live in - by their own conscious effort. However, unfortunately, and it has been so many times down the centuries, the people will not try to understand Life, but let themselves drop into a state of lethargy. They do not exert the necessary effort required to accomplish these things by the power of God within the individual. They begin to lean on the One giving the Radiation. The sustaining power is only withdrawn, when the individual ceases to make conscious effort to understand Life and willingly work in harmonious co-operation with it. 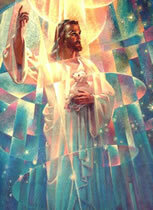 "They rarely realize most of their blessings are the result of the sustaining Power from the One giving the Radiation. If a certain group of souls have been taught the Way of Mastery and reminded lifetime after lifetime of their Divine Birthright the hour arrives when no more assistance is permitted. It is then the Radiation of the Ascended Masters is withdrawn and those souls are compelled to come face to face with the fact the sustaining and accomplishing Power was not due to their own effort. "These must understand they can only receive that for which an effort is made. In such activity, the experiences passed through compel them to make the necessary self-conscious application and when that is accomplished expansion and God-Dominion begin to express. "There is no failure for anyone who continues to make self-conscious effort to express Dominion of the Divine over the human - because failure only comes when self-conscious effort ceases. All experience through which the individual passes exists for one purpose only, and that is to make him aware of his 'Source.' He must learn who he is, recognize himself as a Creator and as such Master of what he creates. "Everywhere throughout the Universe whenever the Power to create is given to a Being the responsibility of creating is always co-existent with the Power. All creation is by Self-conscious effort, and if the individual upon whom this Great Gift of Life has been bestowed refuses to take his responsibility and do his duty, his experiences in Life will prod him with misery until he does, for mankind never was created in a condition of limitation and it can have no rest until the Perfection with which it was endowed in the beginning is Fully expressed. Perfection Dominion Harmonious use and Control of All Substance and Force is the 'Way of Life,' — the Original Divine Blue Print for humanity. "God Within the individual is that Perfection and Dominion. It is that 'Presence' within the heart of everyone which is the Source of Life - the Giver of every Good and Perfect thing. When the individual looks to and recognizes his Source as the Outpouring of All Good, he that moment automatically starts the flow of All Good things unto him and his world because his attention to his 'Source' is the Golden Key that opens every good thing unto him. "The Life in every person is God and only by the Self-conscious effort to understand Life, and express the Fulness of good through himself can the discord in the outer experience cease. Life the Individual and The Law are 'One' and so it is unto Eternity. "Come," he continued, "we will go to a buried city near the Jurua River." We traveled west, and soon came to a slight elevation. 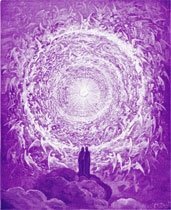 Saint Germain extended his hand, and again vivified the Etheric Records of those people. The place we observed was the second city of importance in the empire. The one from which we had just come was the focus of spiritual power and activity, while the second, we were now to see, was the seat of commercial and governmental operations concerned with the physical welfare of the population. Here, was located the national treasury, mint, governmental, experimental, and inventive activities. Not far distant from this city, rose the Mighty Andes, the source of the immense mineral wealth of the empire. I noticed one thing among these people that seemed most remarkable. All were so completely at peace and thoroughly contented. They expressed quiet and exquisite rhythm as they moved about. The pictures came to an end, and we proceeded to the only rocky spot visible. Saint Germain touched one of the rocks. It moved aside, and we saw a flight of twenty metal steps leading down. These we descended and came to a metal door. We passed through, went down twenty steps more, and found ourselves before a massive sealed bronze door. He reached to the right, and unsealed a square opening in which were metal stops like those of an organ. He pressed two of these, the great mass slowly opened, and we stood in an immense room with everything just as it had been in that far off time. It had been used as a display room for inventions et cetera to which the public had access. All the fixtures were made of metal combined with what looked like opalescent glass. "This", said Saint Germain, "was made by a fusing process combining certain metals with glass in such a way as to make the metal strong as steel and Imperishable. One man in the present age came very near the discovery of the same process for he had all but one element, and that would have made it imperishable." The entire room was lined with the same peculiar metal and three massive doors led from it. Saint Germain went to a box of stops, pressed three of them, and all the doors opened at once. We entered the first one and found a passage long and narrow, more like a vault than a room. It was lined with containers filled with discs of gold about the size of a silver dollar, stamped with the head of the emperor and an inscription that read "God's Blessing to Man". Entering the second door, we found similar containers filled with uncut jewels of all kinds. In the third room, the containers were flat, and held thin sheets of gold on which were written the formulas and secret processes used in that period. 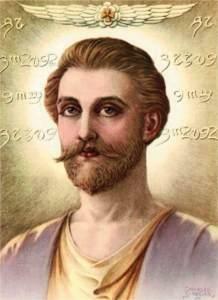 "Among these", said Saint Germain, "are many formulas and processes which were not used in that former time. They will be given into the use of the present age." He went back to the box of stops and pressed another. A fourth door opened which I had not noticed before. This led into an arched tunnel or passageway connecting the treasury with the mint. It must have been at least a quarter of a mile long and at the far end we entered an enormous room. It was the main part of the mint, and was filled with a maze of machinery of most wonderful construction. Among many things I saw were machines used for stamping the gold and cutting and polishing the jewels. They simply fascinated one so perfect was their operation. Here, Saint Germain showed me a specimen of malleable glass, clear as crystal. "It is utterly impossible for such quantities of wealth as you see before you to be released unto the mass of mankind because the selfishness within the commercial world at the present time makes it the height of folly to let humanity waste more of Nature's gifts. "God and Nature bestow their wealth lavishly upon the earth for the use and blessing of the Souls who incarnate here but the selfishness and lust for power within the feelings of mankind make them forget the 'Higher Way of Life,' and cause man's inhumanity to man. "The few who rise to control of the mass should have the Intelligence to know that what helps the mass helps the individual most but if they refuse to recognize this 'Law' self-destruction follows brought about by their own selfishness. Selfishness and the feeling of power to control others blind the reason and dull the perception of the outer mind to its own dangers and such individuals ride headlong to ruin in every case ruin spiritually mentally morally and physically extending any times into the third and fourth embodiment following. "Mighty God enter so firmly into the hearts of Thy children that they want Only Thee, then none shall want for any of Thy Great Gifts." He sealed everything as we had found it, and we returned to my body - which I re-entered quickly. "My beloved son, you will be a very valuable helper and may God always bless you.' With that blessing, he bowed and was gone."